4 Bedroom Detached House For Sale in Newton-le-Willows for Offers Over £265,000. 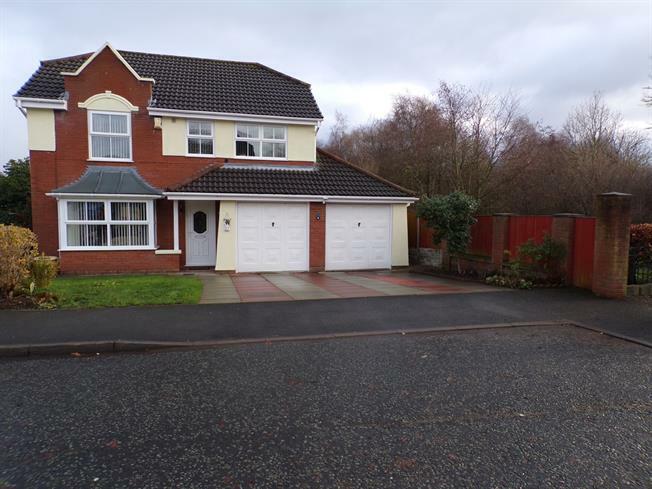 We are delighted to offer for sale this impressive four bedroom detached family home, the property occupies a pleasant position in a sought after area. It is conveniently placed for local shops, schools and amenities, being only a few minutes walk away from Newton High Street. Excellent public transport and commuter links are offer. In brief the spacious accommodation comprises; Entrance hall, lounge which is open plan in to dining area, newly fitted kitchen/breakfast area, utility room, WC and large conservatory to the ground floor. Whilst, to the first floor, there are four bedrooms with the master having an en-suite shower room facility and family bathroom. Externally, there property boasts a good sized plot, with a laid to lawn garden to the front, with driveway providing ample off road parking and access to the double garage. Whilst, to the rear, there is a private enclosed laid to lawn garden with patio area. Internal inspection is advised to fully appreciate both the size and what this property has to offer.. Door to front, alarm keypad, radiator. Window to front and side, feature marble fire surround housing living flame gas fire, radiator, storage cupboard. French door to rear, radiator. Window to rear, recently fitted with a range of matching high gloss wall and base units with work surfaces over, inset sink unit, integrated dishwasher, radiator, laminate flooring; open plan into breakfast room. Door to rear, laminate flooring. French door to side, providing access to patio area, laminate flooring, under floor heating. Door to side, wall units, boiler, laminate flooring. Window to side, fitted with a vanity unit housing wash hand basin and low level WC, radiator, laminate flooring . Window to front, fitted with a matching suite comprising; shower cubicle, vanity unit wash hand basin, low level WC. Window to rear, fitted with a matching suite comprising panelled bath with shower over, vanity unit housing wash hand basin, low level WC, radiator, laminate flooring. Two up and over doors to front, door to side, light and power. The property boasts a generous sized plot and occupies a pleasant position in a sought after cul-de-sac. To the front, there is a laid to lawn garden with flower and shrub borders, with driveway providing off road parking and access to the garage. Whilst, to the rear, there is a private laid to lawn garden with flagged patio area.